Today I had fun doing my nails. This cute design was very easy to do. I applied nail polish horizontally on the makeup sponge and sponged it on. 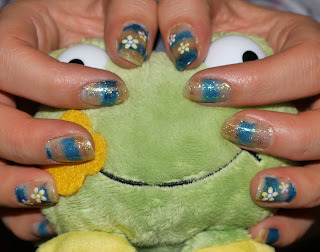 Then used few flower stickers and glitter nail polish. I've finished the design with clear top coat. Voilà!